Zappi, D. (2009). Neotropical Caprifoliaceae. Shrubs, vines, lianas, rarely trees. Leaves simple , opposite, sometimes ternate, with vestigial interpetiolary stipules, entire , margins often crenate . Inflorescence generally axillary , cymose, bracteate. Flowers showy, hermaphrodite , slightly to strongly zygomorphic ; sepals (4-)5, united in short tube; corolla (4-)5- lobed , joined in a zygomorphic tube, white, pink or red; stamens 3-5, fused to the corolla -tube, anthers 2-locular; ovary inferior, (2-)3 carpellate, style long, exserted , stigma capitate , placentation axile , ovules 1-many per locule . Fruit fleshy , generally berries (nutlet in Vesalea), 1-many seeded. In former classifications, the Caprifoliaceae used to include species with actinomorphic flowers, such as Viburnum and Sambucus, but those are nowadays placed within the Adoxaceae after molecular studies (APG II, 2003). The old circumscription is still followed by Delprete in Smith (2004). In 'APGII' (Angiosperm Phylogeny Group, 2003) an expanded Dipsacales was promoted in the 'Euasterids II', including a broader concept of the Caprifoliaceae, which encompassed the Dipsacaceae and Valerianaceae known from the Neotropics, along with the Adoxaceae. If sunk into the Caprifoliaceae the Dipsacaceae and Valerianaceae would form very discrete subfamilies. However, in Neotropikey the three families (Caprifoliaceae, Dipsacaceae and Valerianaceae) are treated separately, q.v. Vesalea R. Br. 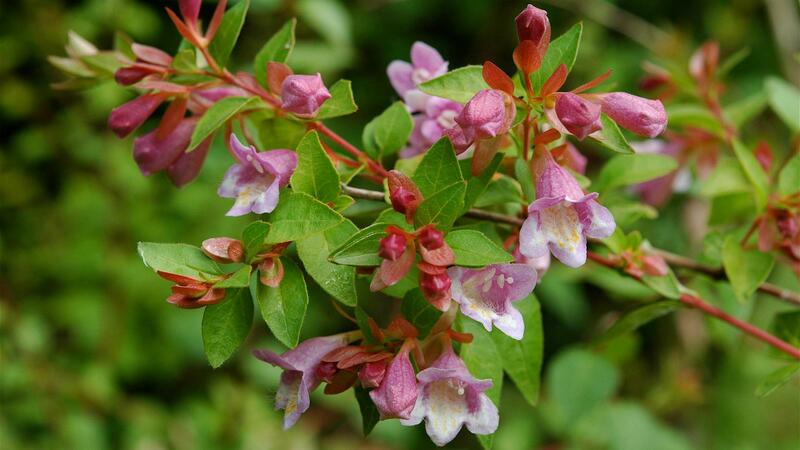 (formerly Abelia) - Temperate Asia, reaching Mexico, 2 - 5 species. Lonicera L. - honeysuckle, from Asia, N. Africa and North America south to Costa Rica, 5 species. Symphoricarpos Duhamel - snow berry, C. China; North America, reaching Guatemala, two species. Many species of Caprifoliaceae are cultivated in the Neotropics, especially Lonicera and Vesalea. However, this is not a very prominent family in the region, with only a few species ocurring only marginally in the area. In the Neotropics, the Caprifoliaceae is a marginal family with a few genera ocurring at high altitude and reaching Mexico from the West of the USA, and none are native in South America. Leaves opposite, margins rarely entire. Ovary inferior with 3 carpels. The opposite leaves, inferior ovary and tubular corolla may generate confusion with the Rubiaceae, but the Caprifoliaceae flowers are mostly zygomorphic and their stipules are vestigial. 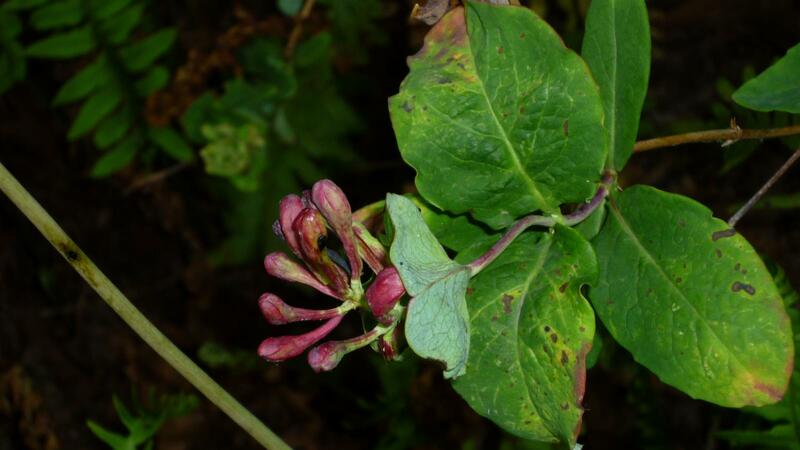 Lonicera japonica is often cultivated in the Neotropics. APG II, 2003. An update of the Angiosperm Phylogeny group classification for the orders and families of flowering plants: APG II. Botanical Journal of the Linnean Society 141(4): 399-436. 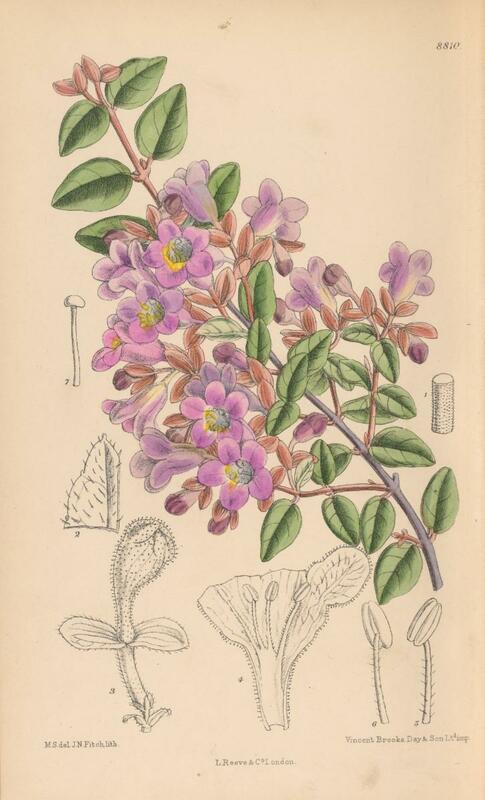 Delprete, P. Caprifoliaceae in Smith, N., Mori, S.A., Henderson, A., Stevenson, D. & Heald, S.V. 2004. Flowering plants of the Neotropics. NYBG, Princeton Univ. Press. Souza, V.C. & Lorenzi, H. 2005. 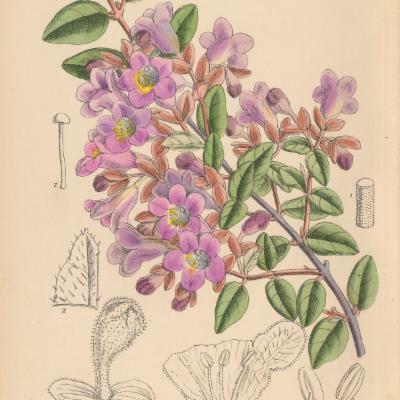 Botânica Sistemática: guia ilustrativo para identificação das famílias de Angiospermas da flora brasileira, baseado em APG II. Nova Odessa, Brazil: Instituto Plantarum. Hind, D.J.N. (2009). Neotropical Valerianaceae. 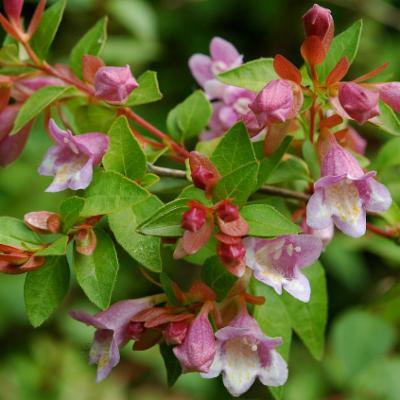 Terrestrial annual , biennial , or perennial herbs sometimes subshrubs or cushion-forming shrubs or shrublets, or climbers or scandent plants, usually with characteristic odour, especially when dry (associated with valeric acid); monoecious , dioecious or gynodioecious. Rootstock fibrous , sometimes rhizomatous, or possessing conical, napiform or fusiform taproots. Stems often hollow, often glabrous , or variously pubescent , sometimes glaucous . Leaves opposite or alternate , whorled or basal , sometimes decussate , exstipulate , simple or pinnatisect , variously shaped, base usually clasping , sessile or petiolate , margins entire or serrate . Inflorescences cymose, usually compound , often densely so, with many small flowers, bracteate. Flowers hermaphrodite or unisexual, sessile or short-pedicellate, usually zygomorphic (especially with funnel-shaped corollas, but symmetrical with rotate corollas) and bilaterally symmetrical. Calyx persistent and often becoming woody in fruit , 0-5- lobed , each lobe of few to many segments, very small in flower and markedly inrolled and imbricate , often enlarging to a pappus on apex of fruit , pappus frequently plumose, sometimes absent. Corollas white, pink red or lilac, or very rarely yellow, funnel-shaped, subsalverform or rotate, corolla tube usually longer than corolla lobes, often bulging on one side, saccate or spurred below; corolla lobes 5; stamens 1-4, usually inserted near base of corolla tube and alternating with lobes, usually exserted from corolla , sometimes included; anthers sessile , on short filaments, or filaments distinct, versatile, 2- or 4- lobed , dehiscing introrsely; stigma 2-fid, 3-fid, or subentire, exserted . Ovary inferior, 3-celled, 1 cell with pendent ovule and other 2 sterile and often much reduced in fruit . Fruit dry and indehiscent , glabrous or variously setuliferous or hairy; seed endospermic with straight embryo. Valeriana L. is widespread throughout the Neotropics from Mexico south to Argentina. Most of the other genera in the family are restricted to the high altitude areas of the Andes throughout the region. A characteristic capitulum in the Dipsacaceae surrounded by an involucre of more than 2 bracts, and a fruit surrounded by an epicalyx. In the Valerianaceae a capitulum is never present, and the epicalyx is absent. Modifications of the calyx which, if present, form an often distinctive plumose pappus. Inferior 3-carpellate ovaries, one fertile carpel. In addition, dried members of the tribe Valerianeae have a characteristic odour of valeric acid, although this is absent in the tribe Patrinieae. Centranthus ruber (L.) DC., an Old World species, is reportedly a weed in some areas of South America, as is Valeriana officinalis L.
Eriksen (1989a) reduced all of the South American representatives of the Valerianaceae to one amorphous Valeriana, s.l. She maintained this exceptional lumping in her treatment for the Flora of Ecuador (Eriksen 1989b). Weberling (2001) commented on this and, with the supporting evidence of Backlund & Donoghue (1996), maintained the status of the smaller South American genera together with a more restricted sense of Valeriana. As now accepted, there are between 10-13 genera, and some 350-450 species, worldwide. Mainly distributed in the northern hemisphere, South America, and southeastern South Africa. One or two weedy species found in the Neotropics. Valeriana L. (the largest genus in the family), widespread in both the Old and New World. The only apparent delimitation problem appears to be with the inclusion of Triplostegia Wall. ex DC. in the family; it is often placed in its own family within the Dipsacales. It does not pose any problems with delimitation of the Valerianaceae in the New World. Backlund, A., & Donoghue, M. J. 1996. Morphology and phylogeny of the order Dipsacales. Pp. 1-27. In: Backlund, A., Phylogeny of the Dipsacales. Acta Universitatis Upsaliensis, Uppsala. Borsini, O. E. (1962). Revisión de las valerianaceas de Brasil. Lilloa 31: 149-170. Borsini, O. E. (1963). Valerianaceas del estado de Santa Catarina (Brasil). Sellowia 15: 123-136. Enrech, N.X. de (1992). Valerianaceae. In: G. Morillo (ed. ), Flora de Venezuela, (T. Lasser, ser. ed. ), vol. 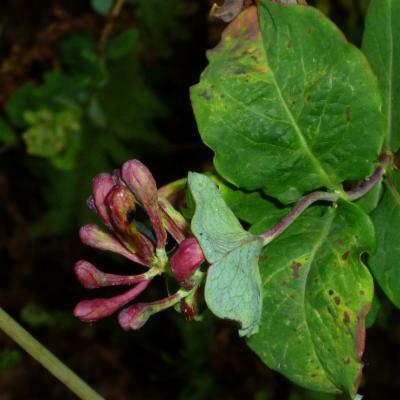 5, part 1: Cucurbitaceae (C. Jeffrey & B. Trujillo), Sabiaceae (J. 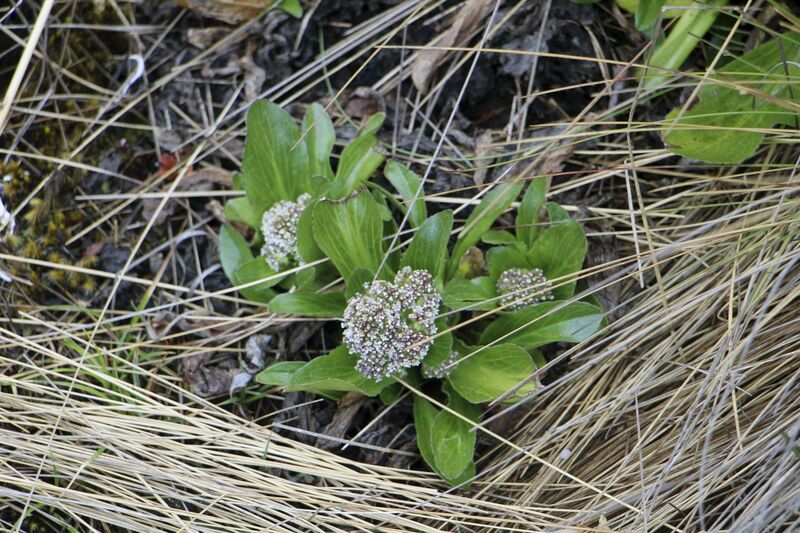 A. Steyermark), Valerianaceae (N.X. de Enrech). Fondo Editorial Acta Cientifica Venezolana, Caracas. pp. 267. [221-266]. Eriksen, B. (1989a). Notes on generic and infrageneric delimitation in the Valerianaceae. Nordic J. Bot. 9(2): 179-187. Eriksen, B. (1989b). Fam. 186. Valerianaceae. In: G. Harling & L. Andersson (eds), Flora of Ecuador. Vol. 34. Department of Systematic Botany, University of Göteborg & Section for Botany, Riksmuseum, Stockholm. pp. 59. Graebner, P. (1899). 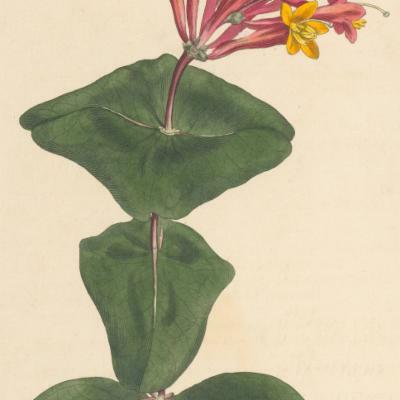 Beiträge zur Kentniss der süd- und centralamerikanischen Valerianaceae. Bot. Jahrb. Syst. 27: 425-436. Killip, E. P. (1937). Valerianaceae. In: J. F. Macbride (ed. ), Flora of Peru. [Pibl. Field Mus. Nat. Hist.] Fieldiana, Bot. Ser. 13 (Part 6, No. 2): 287-321. Meyer, F. G. (1951). Valeriana in North America and the West Indies (Valerianaceae). Ann. Missouri Bot. Gard. 38: 377-503. Meyer, F. G. (1976). Family 181. Valerianaceae. In: R. E. Woodson, Jr., R. W. Schery, & collabs., Flora of Panama, Part. IX. Ann. Missouri Bot. Gard. 63(3): 581-592. Richardson, I. B. K. (1975). A revison of the genus Centranthus DC. (Valerianaceae). Bot. J. Linn. Soc. 71: 211-234. Rzedowski, J. & G. C. de Rzedowski. (2003). Familia Valerianaceae. In: Flora del Bajio y de regiones adyacentes. Fasciculo 112. Instituto de Ecologia, Pátzcuaro, Michoacán, México. Sobral, M. (1999). Valerianaceae. In Flora ilustrada do Rio Grande do Sul, 25. Boletim do Instituto de Biociencias 58, Universidade Federal do Rio Grande do Sul, Porto Alegre. pp. 61. Weberling, F. (2001). Reappraisal of our current knowledge of the genus Stangea Graebn. (Valerianaceae). Akademie der Wissenschaften und der Literatur, Abhandlungen der Mathematisch-naturwissenschaftlichen Klasse Nr. 2. Mainz. pp. 51. Hind, D.J.N. (2010). Neotropical Dipsacaceae. Annuals, biennial or perennial herbs, rarely shrubs. Roots fibrous or sometimes tuberous. Stems glabrous or variously pubescent , sometimes with prickles , often with basal rosettiform leaves, especially when young, or leaves cauline. 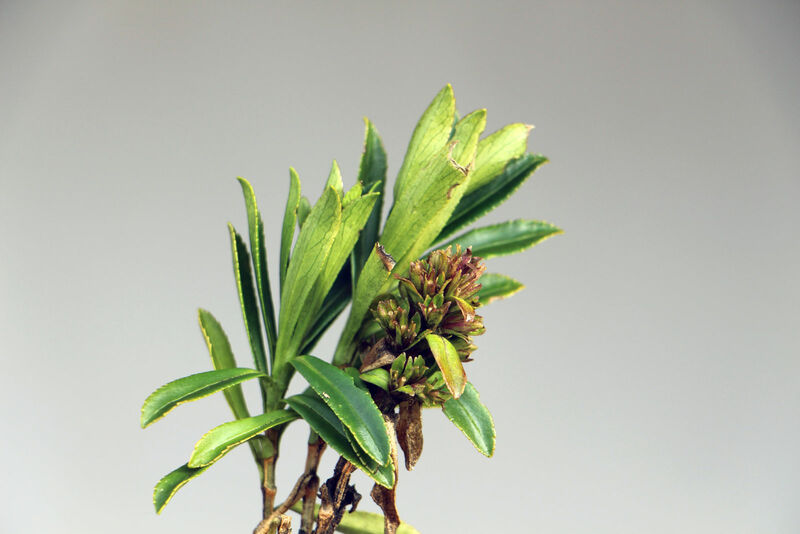 Leaves opposite or verticillate , exstipulate , sessile , pseudopetiolate or petiolate , bases sometimes connate , sometimes heterophyllous with lower leaves usually simply but upper leaves variously lobed , lamina entire or deeply lobed , laciniate , lyrate - pinnatifid , or 1-2- pinnatisect , margins entire or variously toothed, glabrous or variously pubescent , sometimes the prickles on lower surface (especially on venation ). Inflorescences terminal or axillary , of dense cymose capitula, subtended by phyllaries 1-3-seriate, phyllaries free or rarely connate in basal half, flowering occurring at several points in capitulum , or rarely from apparent middle and working outwards (i.e. Dipsacus L.). Capitula appearing radiate/radiant, ovoid or subglobose, hemispherical or cylindrical. Florets hermaphrodite or female, each usually with a basal epicalyx (involucel) of connate bracteoles sometimes expanded into a variously shaped, often scarious , corona and often subtended by a receptacular scale, involucel variously angled or ridged, receptacular scales linear - lanceolate , sometimes spine -tipped, glabrous or variously pubescent ; calyx small, cupuliform or divided into 4-5 teeth or of numerous teeth or setae; corollas usually zygomorphic , lobes 4-5, subequal, or corolla 2-lipped, blue, lilac, white, yellow, pink, red, purple; stamens free , 2 or 4, epipetalous, alternating with corolla lobes, and usually conspicuously exserted from corolla , anthers dorsifixed, dehiscing introrsely via longitudinal slits; stigma solitary or 2- lobed ; ovary inferior, unilocular, ovule pendent. Fruit dry, indehiscent , enclosed by epicalyx and usually surrounded by persistent calyx , fruit body variously angled (4-), very rarely with an elaiosome at base (Knautia L.); seed 1, endospermic, embryo straight. Dipsacusfullonum and D. sativus (both probably cultivated but occasionally naturalized). Scabiosa atropurpurea (often cultivated, and escaped). Underside of the leaves with conspicuous prickles. The leaves are heteromorphous with entire or toothed lower leaves and pinnatifid cauline leaves. Capitulum, surrounded by a few-seriate involucre. The presence of radiate/radiant capitula in most genera is a useful character. In Dipsacus the odd flowering pattern (acropetal/basipetal) is characteristic, along with the distinctly prickly stem and underside of the leaves, together with the connate leaf bases. Similar families include the Calyceraceae and Compositae in the presence of numerous florets arranged in capitula sometimes with receptacular bracts present. Included or exserted stamens with connate anthers (vs. stamens exserted with free anthers). Achenes with or without a pappus of scales or hairs (vs. the presence of the involucel and persistent coroniform calyx in the Dipsacaceae). The Dipsacaceae also have either 2 or 4 stamens; the number of stamens in Compositae is rarely reduced to 4. Stamens in the Calyceraceae are alternating with the corolla lobes whereas they are epipetalous in the Dipsacaceae. Although both the Dipsacaceae and Calyceraceae have persistent calyces those in the Calyceraceae typically become lignified and spiny; those in the Dipsacaceae become cupuliform or divided into a number of setae. An involucel is only found in the Dipsacaceae. Anthers in the Calyceraceae dehisce antrorsely whereas those in the Dipsacaceae dehisce introrsely. Both representatives of the family found in the Neotropics have been/are cultivated in a number of countries, and have naturalized. The greater part of the family (7 genera and c. 250 spp.) are found in the Old World in Asia, Eurasia and northern Africa. Only tow are found in the Neotropics. Only two are found in the Neotropics. The family appears to be reasonably naturally delimited, although some floras expand the family concept with the inclusion of the Morinaceae (Morina L.) with its spikes of false verticellasters, and Triplostegiaceae (Triplostegia Wall. ex DC. ), with its characteristic double epicalyx. In the Neotropics the three taxa commonly encountered: Dipsacus fullonum L., D. sativus (L.) Honckeny and Scabiosa atropurpurea L., are all easily placed in the family sensu stricto. Nash, D.L. 1976. Dipsacaceae. Flora of Guatemala. Fieldiana, Bot. 24. (11 no. 4): 275 - 431 (1976) p.306. Verlaque, R. (1984). Etude biosystematique et phylogenetique des Dipsacaceae: 1. Delimitation des Dipsacaceae a l'interieur des Dipsacales, rapports avec les autres familles de l'ordre. (Biosystematic and phylogenetic study of Dipsacaceae: 1. Delimitation of the Dipsacaceae and their relations with other families of the Dipsacales.) Rev. Gen. Bot., 91. (1079-1080-1081): 81-121. Cephalaria Schrad. ex Roem. & Schult. Milliken, W., Klitgard, B. and Baracat, A. (2009 onwards), Neotropikey - Interactive key and information resources for flowering plants of the Neotropics.